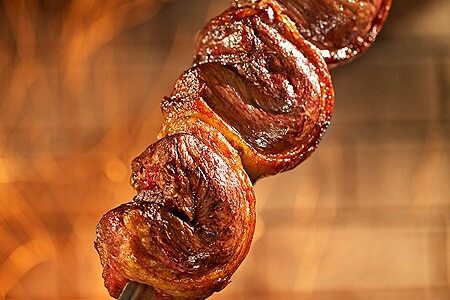 A cultural as well as a culinary experience, Fogo de Chão makes for great celebration fare. : Gutting the entire former restaurant space, this Dallas-based company crafted the perfect spot for its Atlanta endeavor. Gleaming, dark woods shape what the eye sees. First you claim your seat, then you claim your portion of the huge salad bar: best to go easy here as there's a lot of food and it's all tasty, including the house-made mozzarella, the smoked salmon, a potato salad, the greens, black beans on rice and more. When you've finished with the salad bar, turn over the colored disk on your table, and this will clue the gaucho-garbed staff to start presenting you with your selection of meat, from chicken to sausage and even better beef and lamb --- all rich, oozing juices and suspended along long skewers. We hold out for the picanha, a moist, specialized cut. Good side dishes include mashed potatoes and yucca. There is dessert, but who can deal with it after all the meat? If you can, go for the papaya cream with a dash of cassis. The extensive wine list includes some Brazilian options. Also located at 4671 Ashford Dunwoody Rd., Dunwoody, 678-691-7268.